Ask fellow campers about "Woodhaven RV Park of Halifax" and nearby attractions. We have stayed here for the past 6 years for 2 weeks in August and 3 weeks in September. The park is very close to all amenities. Sites are treed with 3 way hook up for 30 and 50 amp. We like it very much. It has a combination of permanent and daily campers and is kept very clean. The park has it's own Laundromat which is very handy. We camped at Woodhaven RV Park of Halifax in a Fifth Wheel. About a 20 minute drive to downtown Halifax. There is a supermarket, hardware and liquor store about 10-15 minutes away. There is a Shell petrol station with diesel about 10 minutes away. Woodhaven RV Park is very pretty: large, gravel sites, well wooded, with trees separating the sites. And the wifi is good, at least for my computer; my tablet and phone are having some difficulties. But the water system was under a boil ban, indicating a failure of maintenance, and I had to rely on my fresh water tank. Had the water been clean, I would have rated this park a 7. We camped at Woodhaven RV Park of Halifax in a Fifth Wheel. A nice location for visiting the Halifax area. The park has a lot of mature trees between and around the sites. The sites are gravel, narrow and very uneven. We had a lot of problems finding a spot flat enough to level even using our blocks. The park has a nice pool, decent bathrooms and showers and a game room. The customer service at the front desk was poor and the wifi did not work well enough to check email. We would recommend looking at other parks in the area. See our updates, review and pictures at our blog at thegilliamsisland. We camped at Woodhaven RV Park of Halifax in a Motorhome. Rate is in Canadian Dollars. Jammed in like sardines up against other RVs. RVs are parked back to back and side to side. No room to extend awning, barely enough room for the slides. Fire pit and picnic table right up against the RV. 30 Amp service but no circuit breaker, full hook-up, no cable with 3 OTA TV channels. Utilities are at the back of the RV, extra hose and electric cord required. The laundry is closed until further notice. Verizon cell service is 3 bar/4G. WiFi is weak, intermittent and unsecured. There's a about 50% long term residents. 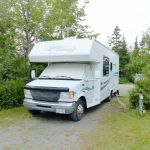 We camped at Woodhaven RV Park of Halifax in a Fifth Wheel. Nice and clean, lots of trees but enough room; many pull-throughs. Enjoyed walking through the campground. Half hour from Halifax, just on the edge of suburbs. We didn't learn that there had been a boil alert until two days later; sign on bathroom, which we don't use. I feel the park should have notified us. We camped at Woodhaven RV Park of Halifax in a Motorhome. Try the Thunderbird Cafe just down the road to the west. The sites vary greatly, so if you want some space and shade, request it when you make your reservation. Some sites were close together with no shade. We were in site 11, and although it was only 30 amp, there are trees on both sides, so we didn't need to run both ACs despite the temps being high. Nice dog walking path behind the campground that you access thru site 45. Didn't use any amenities. We camped at Woodhaven RV Park of Halifax in a Motorhome. We drove into town and parked to the side of the Citadel and after touring it, walked down to the waterfront. Don't miss the Public Gardens! They are very close to the parking lot. If you are coming from the US, bring your own bottled water. There is a 10 cent deposit on every bottle! 15% tax on everything too, so if you don't like to tip on tax, pay attention to your receipt. I don't understand some of the other reviews. This is a fine, family owed campground. Ok it's not a 10 but anyplace that has modern clean bathrooms, wifi that works, level sites etc. is fine with us. Woodhaven is about 8 miles from downtown Halifax where there is lots to see and do. Many attractions and lots of restaurant choices. Home Depot, Walmart and Costco about 5 miles away so all good. We would come back if in the area again. We camped at Woodhaven RV Park of Halifax in a Motorhome. Well laid-out with both open sites and others in the trees. We chose to save $5/nite with 30amp in open pull-thru section for satellite reception. Some of the best maintained dirt/gravel roads we've seen. Superb WiFi. about 40psi on their well water--tastes fine too. Nice folks in the office. Worked out to US$40/nite. Note: check-in time is 2 pm so they can mow the site. We camped at Woodhaven RV Park of Halifax in a Motorhome. We had an excellent site right by the washrooms, laundry and office. The employees are very pleasant. The laundry room was great with several washers and dryers. The washrooms were clean, a little dated, but otherwise was great. Our wifi was perfect. 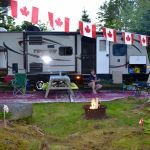 We camped at Woodhaven RV Park of Halifax in a Travel Trailer. Go to Peggy's Cove, it is the best of anything to visit. If you go to Lunenburg eat at Grand Banker Bar and Grill, outstanding seafood with harbor view. Anywhere you go, go early and avoid some of the crowds. This is our 2nd time at this park. Very convenient to Halifax and the Peggy's Cove area. Park is well organized and easy to navigate. This year we were in 2 way sites near the office and the power was a little low, as was the water pressure, but this may be due to the park being pretty full due to Canada Day weekend. Wifi worked OK and staff was very helpful and friendly. We stayed here in a motorhome and would stay here again. We camped at Woodhaven RV Park of Halifax in a Motorhome. Downtown Halifax has a lot of things to see including The Citadel, Farmer's Market, and boardwalk. Peggy's Cove was beautiful and the Swissair 111 memorial was a very touching experience for us. We called to inquire about reservations for later in the day and was told there were plenty of sites and no information other than our name was required. The young man at checking was friendly and efficient and we had a site with a swipe of the credit card and a map with directions to a FHU pull through that was screened from other campers by the trees. Until driving around in the campground, we had no idea how how larger this place is. Access and interior roads are dirt in good shape. It located back in the woods of a residential/commercial street. The campground appeared to be about 75% full and the WiFi was the best we have encountered in several months. 2 local OTA stations from Halifax came in good. Woodhaven is within reasonable driving distance to downtown Halifax and Peggy's Cove. We would definitely return here should we come this way again. Traffic noise was mostly muted by the trees. We camped at Woodhaven RV Park of Halifax in a Travel Trailer. Peggy's Cove has many tourist busses pouring in each day. The site remains beautiful and the wave action is amazing on a day with a good breeze. Don't overlook the Fisherman's Memorial across the street from the visitor's center and the Flight 111 Memorial just off Rt 333 in nearby Indian Harbor. Visit the Citadel in Halifax before noon to witness the noon gun. Inquire about parking before going and plan on a bit of walking uphill. Local tours drop off and pickup visitors at the only entrance. A large very nice park on the outskirts of Halifax. I think the photos on their website are a bit deceptive, especially the one showing the restroom / showers. There are no doors going into the the buildings. Disappointing. We were here during the Labour Day weekend and the placed was pretty much full. We had a fairly level back-in site with trees on either side of us. Our sewer was "up hill" from our camper. Electric (30-AMP) was a bit on the weak side but understandable with the park being full for the holiday weekend. Same with water pressure. All utilities easily accessible. We arrived well before check-in time and the staff were very courteous to us, allowing us to park near the laundry (we we used $2 to wash, $2 to dry, 40 minutes) until our site was available. Very good Wi-Fi. 2 OTA TV channels. Didn't use the pool. Interior gravel roads easy to navigate. We camped at Woodhaven RV Park of Halifax in a Travel Trailer. So much to see and do....Peggy's Cove, Fairlawn Cemetery, Maritime Museum of the Atlantic, and Museum of Natural History. Staff very unfriendly, acted like they really didn't want to be bothered. Site was back to back, small trees on each side of us - not quite big enough yet to block other campers, will probably have to be cut back as they grow because of space issues. Hookups were ok - not great. Water pressure low. A lot of "permanent" campers. We would not stay here again. We camped at Woodhaven RV Park of Halifax in a Motorhome. Eat at The Bicycle Thief in Halifax - so good and right on the waterfront. Walk around the waterfront- a lot to see and do. Visit Halifax Citadel- very interesting fort, with great tour guides inside the fort. Also, visit Peggys Cove, Lunenburg, and definitely Mahone Bay. Aug 2017 Handy location to Halifax, large park with some secluded sites, near level gravel/dirt pads, picnic table and fire ring. FHU. Toilets/showers could use an upgrade as fairly primitive. Wifi non-existent when park full otherwise fair. 2 TV channels. Staff guide you to site. ours was a back in, back to back site. We camped at Woodhaven RV Park of Halifax in a Motorhome. If you use the parking meters and Parallel Park in Halifax, make sure your tires are no further than 150 MM (less than 6 inches) from the curb. They will write you a ticket, $25.00. Easy access to Halifax, Peggy's Cove, Mahone Bay and Lunenburg. About 25-60 minutes away depending on location. Walmart about 25 minutes away. Sobey Supermarket about 10-15 minutes away. Halifax and Dartmouth are about 1/2 hr drive. Mahone Bay, Lunenburg, Peggy's Cove all a short drive and well worth visiting. Try Eli's Espresso in Mahone Bay! Make sure to visit Peggy's Cove & Lunenburg. The wine country in Nova Scotia is about an hour drive north. Halifax has lots of historical sites you can see. White Sail Bakery & Deli. Fabulous baked goods and great sandwiches (they even have picnic tables so you can eat outside). Maritime Museum in Halifax is amazing. Eat at Chives Canadian Bistro, amazing food. Henry House for lunch is fabulous. Drive to Peggy's Cove and Lunenberg. Toured the many points of interest in and around Halifax. Walk the waterfront, Pier 21 Museum of Immigration, Museum of the Atlantic, Spring Garden shopping district of downtown - all in downtown Halifax and all were enjoyable. Check out Ryer Lobsters on Peggy's Cove Road in Indian Harbor, NS for cooked to order lobster and other seafood. Great seafood restaurant a couple of km down the road. Go to east end of Hammonds Plains Rd, turn right and go to Esquire Restaurant, a short distance down the Bedford Hwy on the west side. Best seafood chowder ever. Convenient to Halifax and about a hour's drive to points of interest on the east shore of the Bay of Fundy. And, their WiFi is good! Nice trip to Peggy's Cove and other sites on the south coast of NS. Easy access to historic sites in Halifax. Are you affiliated with Woodhaven RV Park of Halifax ?